You may have picked up this news over the weekend. Hubble's Advanced Camera for Surveys (ACS) stopped working last Monday (19th June) and put itself in a 'safe' mode. Since then engineers have been working to fix the problem. I've been trying to track down the latest news today, it seems that the instrument is not working (at least as of yesterday). There have been problems like this before, but the usually are fixed a lot quicker . . . fingers crossed. As a reminder of the type of images we are used to getting from the Hubble ACS, the image below was released in late April and shows Jupiter's famous Great Red Spot, along with a more recently formed Red Spot Jr.
Red Sport Jr, officially known as Oval BA formed from three white storms in Jupiter's atmosphere which merged in 1998. 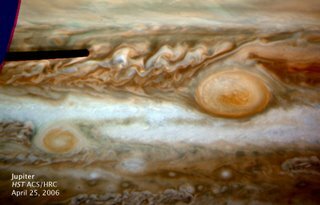 In late 2005 this white spot started to change colour, eventually turning the same colour as the 'Great Red Spot' in February 2006.